Hey, I am a kid of the disco era! The Younts Center for the Performing Arts caps off its season of musicals with an ambitious mounting and Upstate premiere of “The Hunchback of Notre Dame.” Epic in scope, colossal in scale, boasting a grand chorus and smart, creative choices by Artistic Director Melody Yasi, “Hunchback” is a benchmark moment for this company now in its sophomore year. Based on the Victor Hugo novel with music by the great Alan Menken and Stephen Schwartz from the Disney film and a book by Peter Parnell, “Hunchback” is the tragic story of two outcasts – Quasimodo (an otherwise handsome Joel Dupont, who is committed to his character’s deformities and breaks your heart with “Out There” (pining for a life of normalcy) and “Heaven’s Light,” and the gypsy girl Esmerelda, the exotic Akasha Nelson with strength and grace in a star-making turn (“Top of the World”), who takes pity on the poor lad who lives in the attic bell tower. It’s much, much darker than the film version. “Hunchback” is also more political than your average “Disney” musical with an impressive set of Notre Dame Cathedral (designed by Yasi and built by Joseph Hawks and Matthew Christian Jones): the arches, the alcoves, the gargoyles, the many oversized bells, the shadowy visages, the action, swords, fire, special effects, torches, the silhouette of Quasimodo on the catwalk, all beautiful touches that I can without hesitation write that this is the finest show I have ever seen at the Younts Center. “Hunchback” obviously contains some religious devotional music, and overtones (the story “Saint Aphrodisius and the tenets of absolution)” but the Church does not escape Hugo’s brutal pen either, painting our antagonist Dom Claude Frollo (Neel Patrick Edwards) as a brutal hypocrite, proselytizing to Quasimodo about resisting the carnal desires of adolescence, all the while blatantly pursuing (and aggressively) Esmerelda, who is in love with Phoebus, played by the dashing Sawyer Pollock. Young Edwards, who last graced this stage as the comedic chef with a French accent in “The Little Mermaid,” embodies a man about three times his age here. His presence and persona in this dramatic turn is piercingly real and he handily dominates the proceeding whenever he is in a scene. Frankly, it’s been long times since I have seen an actor just outright almost walk away with a show on this scale. Hats off my friend. And this musical features an enormous and magnificent chorus with some familiar names: Josh Broome is in fine form as Clopin in the Feast of Fools (“Topsy Turvy”); Tyler Smith as Frederic Charlus, and Anna Brown as Florika, with John Garrison, Amy Heider-Brown, Laura Bunn, Rebecca Payne, Nathan Oliver and many, many more. Tim St. Clair, II and Steven Griner are music directors and really had their work cut out for them with this show. And the Upstate’s busiest choreographer Kimberlee Ferreira staged the dance numbers. This production also benefits from superior design elements: the lovely period costumes by Danae Harris. Brooke Dersch’s strikingly beautiful lighting, and Blake Ferguson’s sound design. Tiffany Bunch is Stage Manager. My only disappointment at Saturday evening’s performance was the sound. Actors that were not wired with microphones (gargoyle dialogue, multiple narrators) were not always audible. There was the challenge of timing and being a slave to the music tracks with so much underscoring for the dialogue. And the acoustics didn’t always give the chorus that full-bodied sound we would expect from its size, and almost wish we could have heard them a Capella. But that can be remedied. The company still has two full weekends to dazzle you. And “Hunchback” is an admirable achievement of vision and rich musical theatre storytelling eschewing the happily ever after trope. 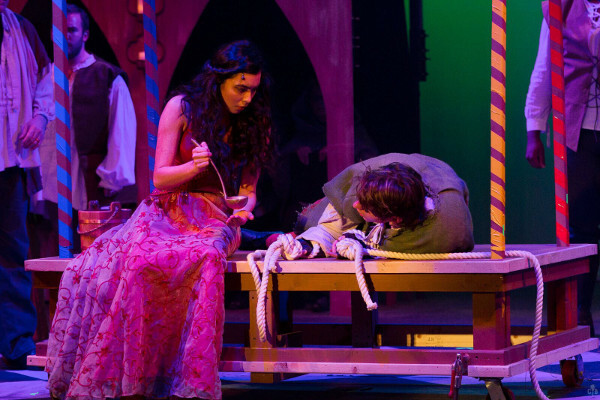 “The Hunchback of Notre Dame” continues through April 7 at the Younts Center for the Performing Arts, 315 N. Main St. in Fountain Inn. For tickets, call (864) 409-1050 or visit http://www.yountscenter.com.